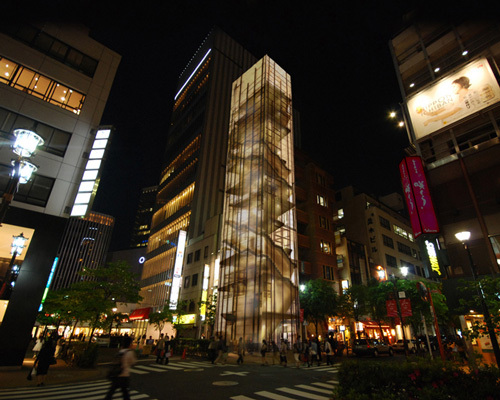 japanese atelier TNA architects has sent us images of ‘ginza natsuno building’, a long and slender structure in the shopping district of tokyo. standing on a plot measuring just 5 meters by 8 meters, the eleven-storey flagship store sells specialty chopsticks, japanese ceramics, and tableware. the structure largely consists of exposed steel framing with perpendicularly crossed beam elements. the density of these components fluctuates from compact to sparse according to the site. in addition to structure, the beams serve as display cases for the shop. from the outside, the glazed skin of the building has a light translucency to give a ‘shoji’ screen effect. lacking a reflective quality or a colorful billboard exterior, the boundary between the interior and the city aims to dissolve away to create an inviting store. this looks pretty cool will it ever be built? the stair enclosure adds a sense of privacy with a nice translucent layering. Beautiful. Remembers me of the Acconci bamboo building a bit? is there an elevator in this concept? i mean it is really beautiful, but who would walk the 9 floors upstairs to the top floor?